Well, hello, Blogtown! Blogville! Blog City, U.S.A.! I’ve taken a much needed break from Yellow Daisy Chick Chat, and I’ll pretend you noticed. I’ll also pretend you have missed me as much as I’ve missed you! After finishing school in the spring, I was burnt to a crisp. I needed to get out of my head and into the Real World for a while. It was a fun, busy summer, and now I can’t believe it’s after Labor Day. With the change of seasons approaching, I thought it was a good time to get back to chickchatting. The next week, I got a job. It found me. Two weeks later, I quit said job. I did not enjoy the job. Among other things, it was not as part-time as advertised. disappointment and stress ensued, but it all ended up the way it was supposed to. Fortunately, a family beach weekend was planned for Labor Day weekend, which was wonderful but very busy, with 2 of us heading to a football game and 2 of us heading to the beach, all to meet back up on Sunday at the beach. Phew. So somehow, we’ve made it through exactly one month of school. It came in like a lion, and at this point, who knows how it will go out? This weekend, I’ve been able to slow it down and breathe, which has been nice. I have some ideas where I want to go career-wise, and it’s in these quiet moments when good thoughts and ideas come to you. I have gotten some reading in, which I have missed more than anything. And, I have cooked! When I say cooked, I mean enjoyed it. I looked through cookbooks, I looked through Pinterest, I planned our weekend food with joy. 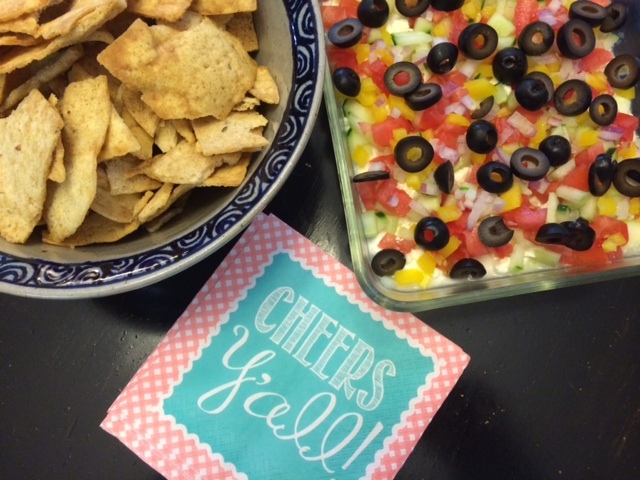 I had a tailgate supper to plan, along with a Sunday dinner and a Meatless Monday. The grind of the busy week can drain all the joy out of cooking; it’s really just work during the week. Squeezing food in between activities can be daunting, and when I get a slow weekend, I can actually remember that I call cooking a hobby. Sure, I needed to do a million projects in my house, but I forgot to mention that our upstairs A/C went out this week, so my project budget just went to that. Sometimes, it’s nice to table those projects and just slow down and breathe. Heat on stove to simmer: 1/2 c hot sauce (we recommend Frank’s); juice from 1/2 orange; dash salt and pepper; 1 t. sugar; 2 T. butter. 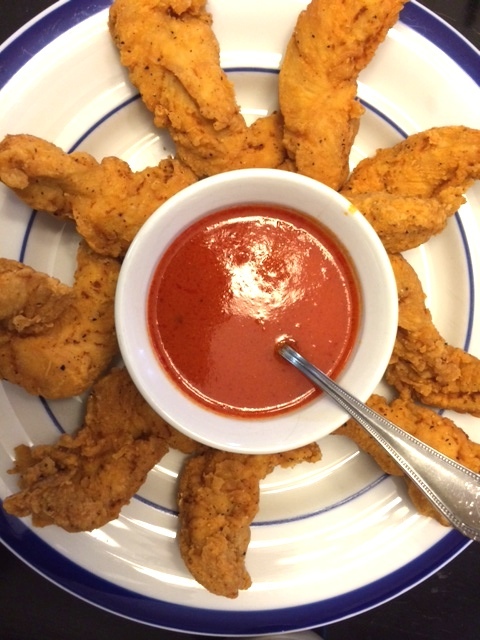 Slather on chicken or serve on the side. Or just take spoon and eat sauce from bowl. 2. 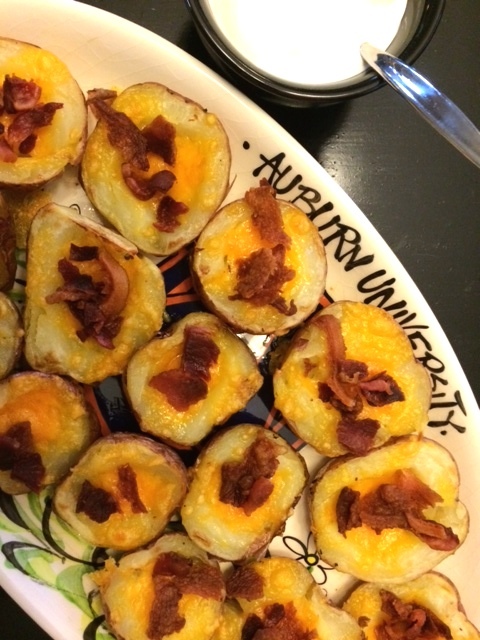 Red Potato Skins. What a great way to use up those last potatoes in the bag! Easy and delicious. Bake the potatoes for 30 minutes on 375. Cut in half, scoop out some of the tater, salt and pepper, and broil til browned. Fill with cheese and broil til melted. Top with bacon and sour cream. Pop in mouth. Layer 1- hummus; Layer 2- Mix plain Greek yogurt with 2 garlic cloves, oregano, pinch of salt and pepper, squeeze of lemon and spread over hummus; Layer 3- Crumbled feta cheese; Layer 4-Diced, seeded tomatoes; Layer 5- Diced, seeded Cukes; Layer 6- Diced red onion; Layer 7: Diced/sliced olives. Enjoy with pita chips. *Note* If you need to make ahead, put veggies on top right before serving to avoid the dip being too liquid-y. 4. Guac and chips. My husband is world-famous for his guacamole. He just has the touch. Ask anybody. No really, anybody! 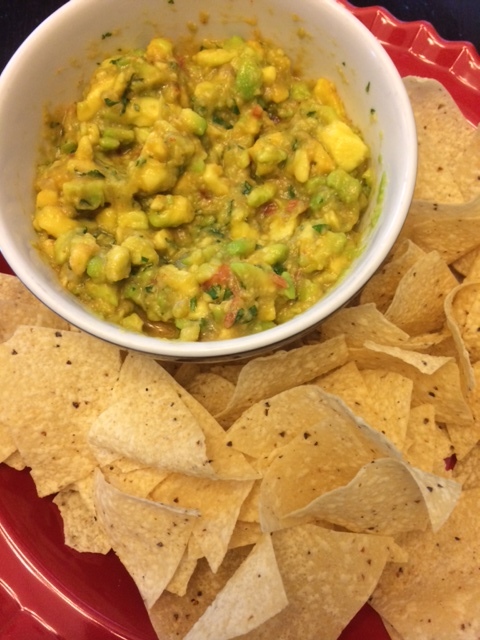 Recipe: 4 avocados, chopped; juice of 2 limes; 2 T. diced red onion; 2 T. diced tomato; 1 t. Sriracha or to taste; salt; drizzle of olive oil; chopped cilantro to taste. Don’t worry about leftovers. There will be no leftovers. 5. 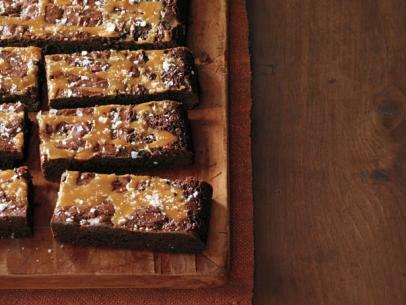 Salted Caramel Brownies. Oh Ina Garten, how I do love thee! And how I wish I were Jeffrey. He must eat better than anyone. The woman does not play. Thank you for being you, Ina. I hope your weekend has been what you want it to be. If not, make next weekend be the one where you get to breathe.